The binocular is based on the silicon high sensitive CCD camera with special system of electronic accumulation and multiplication of a signal and built-in TFT-LCD monitor. The four-stage system of automatic control and superior anti-blooming allow to watch in a wide range of illumination without regulation of contrast and brightness of monitor. The binocular has a wide range of operation from 0.0005lux (starlight) to 30 000 lx (solar day), moreover it has IR illuminator and video out for recording. Binocular can be used for long-range observation, surveillance and registration of moving and immovable objects at the night and day on land or water. 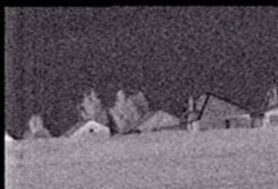 Optional high-power IR LED illuminator allows viewing objects up to 300m in full darkness and with IR laser illuminator ─ up to 1000m. Night Binocular BNV-2 is an optical-electronic device intended for visual observation and identification of various objects in night time, as well as for orientation in terrain and water surface in conditions of natural night illumination intensity from 5x10-3 up to 1 lux and more lower level using the built-in IR-illuminator. Night binocular operating ambient air temperature range is from -30° up to +30°C.